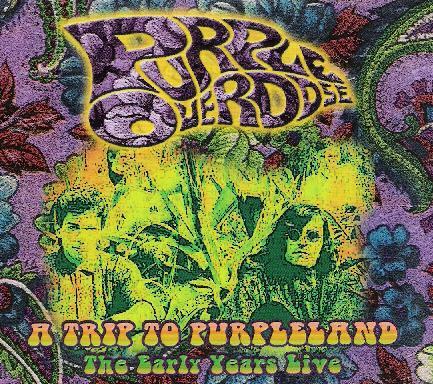 Purple Overdose - "A Trip to Purpleland: The Early Years Live"
From Greece, Purple Overdose existed from the late 1980's through the early years of the new millennium, and played some of the best 60's influenced psychedelia ever… and that includes the 60's bands themselves! The band were unabashedly retro, but with each subsequent album injected increasing progressive influences into the music that gave them a flavor all their own. The band have sadly disbanded, but their memory and music live on due to the efforts and enthusiasm of their manager, Stefanos Panagiotakis. A Trip To Purpleland: The Early Years Live features performances from two 1989 shows and is a testament to what a great live band Purple Overdose were. These are classic free your mind and float away psychedelic songs with killer instrumentation and lots of jam segments. Band classics like "Holes", "Rooby Go Round" and "Yellow Mole" demonstrate what an outstanding songwriter principal member Costas Constantinou was, and what fine practitioners of the psychedelic arts Purple Overdose were, even at this early stage in their tenure. And we hear in abundance how the band exceled at diverging from the basic songs into instrumental exploration. Lots of great tripped out guitar and organ excursions. And "You Gotta Leave" is a killer closing number to disc one that showcases the band going molten acid and followed by a powerhouse drum solo. "Still Ill" is one of two lengthy treats on disc two. It was never on any of the Purple Overdose studio LPs and was only previously heard on the "Painting the Air" rarities release from 2004. That 6 minute track is expanded to over 14 minutes in this live performance, being a raw garage psych rocking, totally trippy jam tune. Ditto for the appropriately titled 14 minute "The Trip", though here Constantinou really lets his hair down on the guitar. In summary, this is an outstanding document of this wonderful band's early years and makes an excellent companion piece to the The Salmons Trip from 2001, which featured later period Purple Overdose performances. For more information you can visit the Purple Overdose web site at: http://www.purpleoverdose.gr. CLICK HERE to read an interview and discography overview published in Aural Innovations #21.